Joe's BMW GTL in the crick. 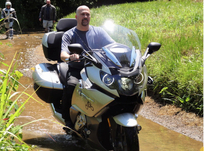 Don't miss these pictures of the BMWROK overnight ride to Bluefield, WV! Click here or on either image to view the show.